I have no idea if the stairs in my home are architecturally holding up my house. But they are the center of our home, quite literally, sometimes figuratively. Situated right in the middle of our house are sixteen steps which I trudge up and down every single day. This is a good day. Usually, we have to grab large armloads of stuff and three pairs of shoes each to take upstairs. The stairs are a catch-all. When I’m too lazy to go all the way up to replace errant toys, clothes, or most often, shoes, I place them at the bottom of the stairs. We have a few wide steps that are perfect repositories for this mess of life. 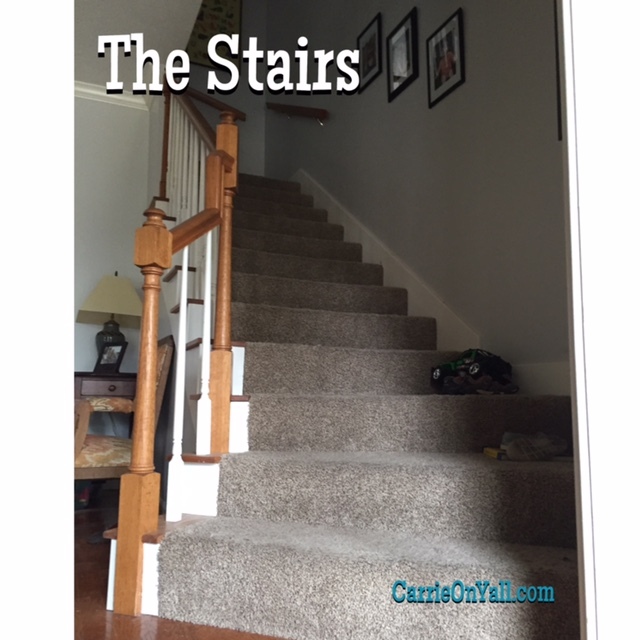 A more organized person would have some sort of system and would have trained her children perfectly… “Clean up your mess at the bottom of the stairs, sweet angels.” Not me. 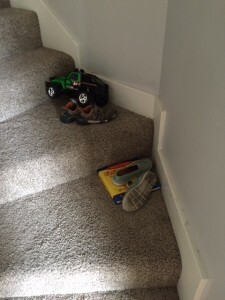 My kids actually leap over their own stuff to get up the stairs. That is some laziness dedication, y’all, and I have no idea where they learned it. I never found a baby gate. We moved into our house when Sawyer was only three months old. I knew the bigger kids could handle the stairs, but I waited until he became more mobile to find a suitable baby gate system. For a variety of reasons…a wide stair width, attaching it to the wall, safety, ease of opening and closing, price, blah-blah-blah…I never pulled the trigger on finding a suitable baby gate for our stairs. 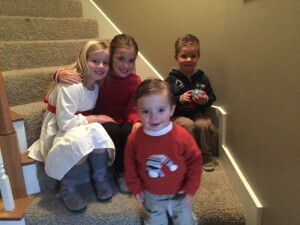 Luckily, Sawyer made it, and he was pretty darn cute climbing up those stairs in a diaper. Please don’t call the baby-proofing police. The middle of the night stairs trip is the worst, but I’ve done that a million times. I’ve done 3am nursing duty, helping sick kids, helping kids who can’t sleep or had nightmares, and I’ve trudged up those sixteen stairs at all hours just make sure they are okay when I can’t sleep myself. I’ve slept in a recliner up there, and I’ve snuggled in next to the big kids in their bigger beds. On special nights, I’ve climbed the stairs to stand guard for the Tooth Fairy and Santa and the Easter Bunny to work their magic. I use the stairs…they are a pathway to my children. They are an extra fifteen seconds for me to breathe when I’ve sent someone to his room for misbehavior. Sometimes they’re the only exercise I get all day. The stairs slow me down when I’m rushing everywhere and to everything. I carry laundry baskets full of my kids’ clothes up and down the stairs, and I can’t help but notice that the clothes are so much bigger than they used to be. My husband and I get on our hands and knees and give the children rides up to bed, and we pose them on the stairs for pictures. Someday, my daughter might come down those stairs in her prom dress or maybe even her wedding dress. 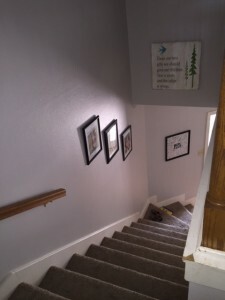 Someday, my boys will come down those stairs and look like young men, not like the little boys I’ve piggy-backed all these years. Someday I won’t have to step over our old dog, who loves to sleep in the corner at the top of the stairs so she can know where everyone in the house is. So today, as I climb each of the sixteen stairs in my home to return laundry and do all the things, I’ll say a little thank you as I get to the top. Loved this post. I was brought up and brought my own children up in a two story home, so can relate from both prospectives. Sliding down the banister and climbing up on the outside of the stair rail was always fun as a child. 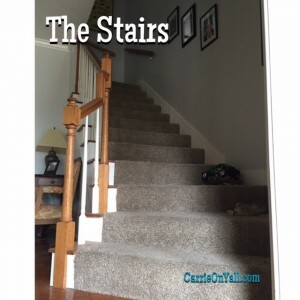 Great exercise as an adult to take the stairs two at a time.